Enhance your company’s presence at IAOM’s 123rd Annual Conference & Expo by taking advantage of the many sponsorship opportunities available. 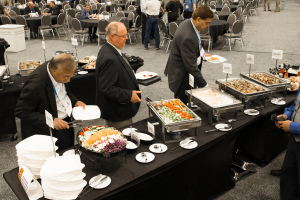 This premier educational event for grain milling and seed processing professionals presents the ideal setting for showcasing your company’s products and services. We are planning for approximately 1,000 highly qualified professionals from around the world to participate in the educational sessions and networking events over the course of the three-day conference. IAOM’s high-impact sponsorship opportunities will give your company the competitive edge to stand out in the crowd. Sponsorship Opportunities and the Sponsorship Reservation form can be found in the 2019 Exhibitor Prospectus. All sponsors from the 2019 Conference & Expo will have first right of refusal to sponsor the same event in 2020. The role of the sponsor is both traditional and important to the annual IAOM Conference & Expo. Thank you to all of our 2019 sponsors for their continuous support of IAOM and its activities.